We use USB Flash Drive on various operating systems, including windows XP/Vista/7/8/10, etc. When data in the USB Flash Drive is lost, we also want to use these operating systems to recover lost data in usb drive.how to recover data from USB flash drive in windows？If you are searching for a quality, fast and free USB data recovery software to recover lost or deleted data on your USB flash drive, an ultimate solution - Bitwar Data Recover shall work for you. Bitwar Data Recover is a fast, reliable and free trial data recovery software with powerful functions. 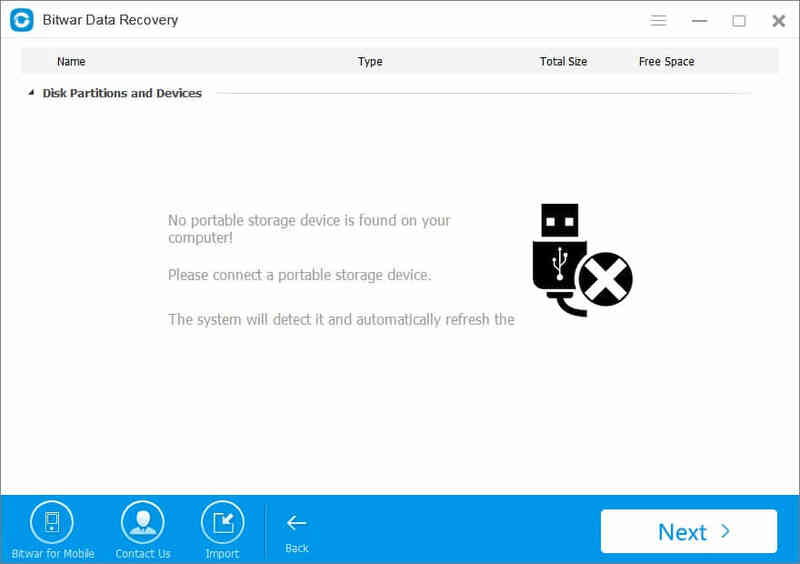 Supporting to recover all missing files and folders from your USB drives, and also allows you to recover data from compact flash, secure digital card, flash memory, and other equivalent mp3, mp4 music players, pocket PC, super drive, thin drive supportive removable media drives. Let's take windows 7 as an example to tell about How to recover data with Bitwar Data Recover. Tips:DO NOT save other files or install softwares to the USB flash drive where you want to recover files. On the wizard mode of the Bitwar data recovery program, you can see 6 different recovery mode, and each of them focuses on different data loss scenarios. Please select “USB/Memory Card Recovery” when you want to recover lost/deleted data from USB flash drive. You can also select “Formatted hard drive recovery” When you want to restore data form formatted USB. Please ensure that your USB flash drive can be well connected to your PC and select it, then click on the butten ”Next”. Select the types of data you want to restore. If the data you want to recover contains more than one type,you can select "Select All Types". then click “Next” to start scanning. After the scan is completed,, The found data will be displayed in the middle window area.you can filter through the file name, type, path, and time in the tree list on the left. you are able to preview them before recovery too. Plus, You can also export all scan results to a specific location after a scan, so that you can load previous results without a rescan when you need it. BUT, please do not export results to the location where data loss appears, because it may overwrite lost data. Finally, choose those you want and click "Recover" button to recover them back from the USB drive. Here, you'd better save all the recovered files on the partition of the computer or different device. Before you commence formatting or partitioning your USB drive, always do a back up of your files. It is not just when you want to format, it is always safe to backup your files in case of any disaster strikes. Do not store files in USB flash drives that has been affected by virus. If you do so the files will be corrupted and you will loss your videos or images. Moreover do not transfer files that are corrupted to your USB flash drive. Protect your USB flash drive by keeping safely. Keep off from dust, heat, cold and any fluids. This will increase the life span of your flash dive and it’s functioning. When you remove your flash drive while in use it results to logical file system failure. Most people tend to plug the flash drive unsafely without considering the content in the flash drive. In some cases the flash drives is damaged when you improperly remove your flash drive from the computer. Next：U disk data loss how to recover U disk data loss how to recover?